The weather is finally starting to warm up in Victoria, and I have been down at the Inner Harbour more frequently because of it. I am looking forward to another busy season of meeting people, working on paintings, and selling my artwork down on the causeway! Once again, my booth will be stationed on the lower causeway, close to Milestones restaurant. In celebration of the arrival of summer, I have completed a new boat painting: "Wildwood". The Wildwood is a boat that docks at the Fisherman's Wharf here in Victoria. 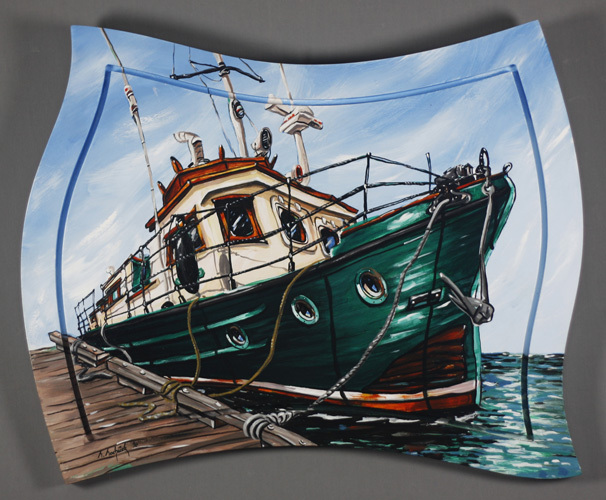 I was drawn to it because of its rich green colour and its character as an older, more weathered vessel. This painting measures approximately 18" x 22" in the custom wood frame, and it is priced at $975 (CDN). 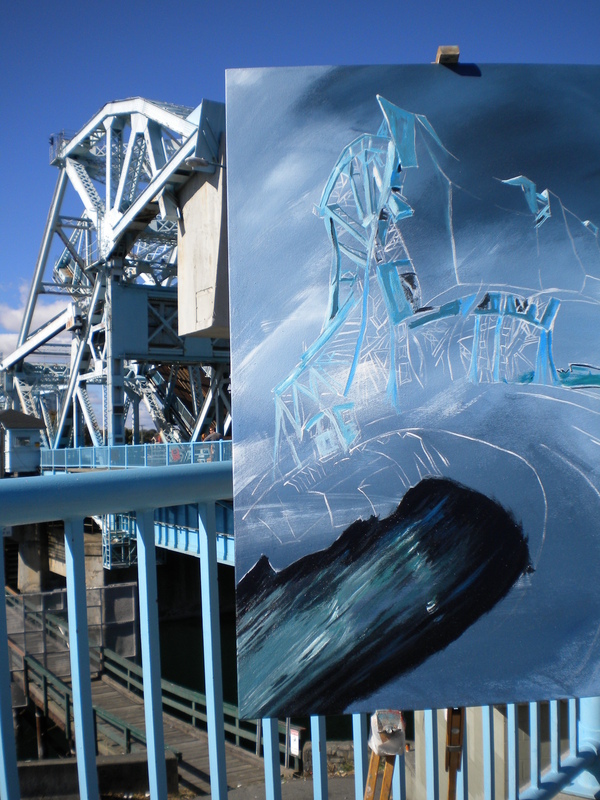 The Fisherman's Wharf is one of the most inspiring places in the city of Victoria to me, and I have dozens of paintings planned of it for the future. Please stay tuned to my website, where more paintings will be added as they are completed. In the meantime, I encourage you to visit the Fisherman's Wharf in Victoria and to savour its colourful, eclectic vibe. 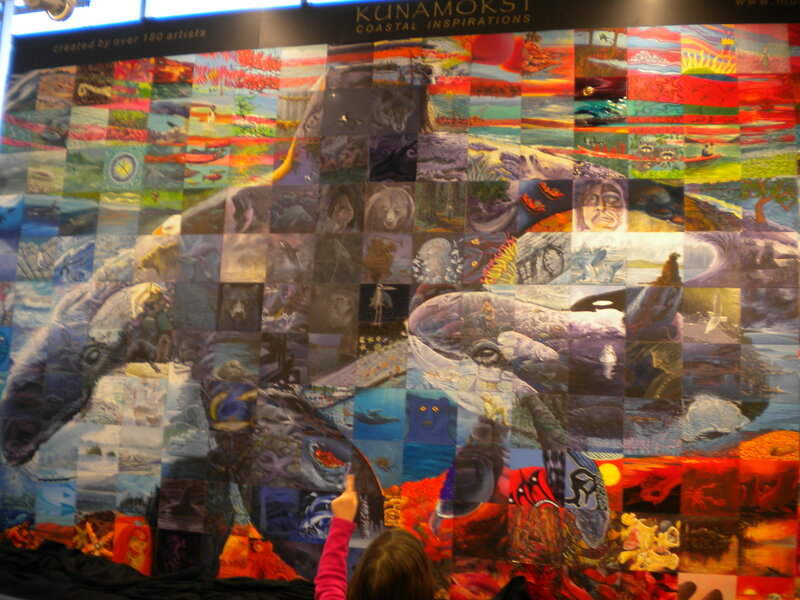 After spending a month in Vancouver during the Olympic Winter Games, the Kunamokst Mural Mosaic has now been moved to the Victoria International Airport, where it will be on display as a special art exhibition until June 17, 2010. 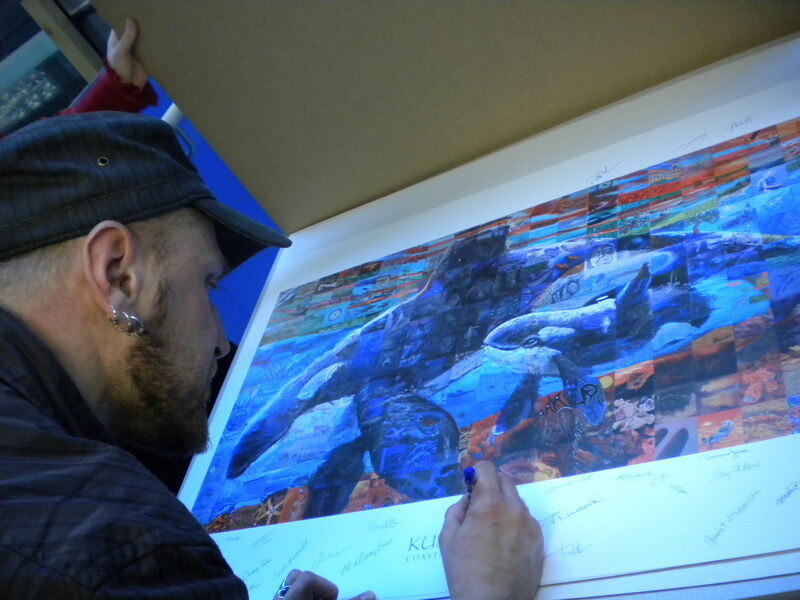 After this exhibition, the mural will be installed permanently at the Oceanfront Inn & Spa on Galiano Island, B.C. I am excited that people local to (or visiting!) Victoria now have the opportunity to see this incredible mural in person. Although the website for the mural mosaics is wonderfully comprehensive, there is really something to be said for seeing the mural in real life. The size and scope of the mural is truly breathtaking! Once again, my panel is #102, located on the back of the mother orca (near the tail). I encourage everybody to see the mural while it is on display here if they can! 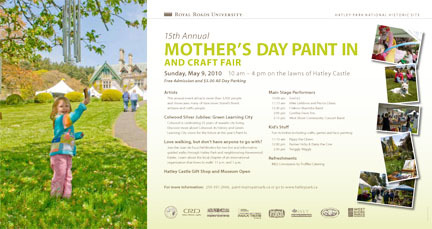 I am happy to announce that I will be participating in the 15th annual Mother's Day Paint-In and Craft Fair at Hatley Castle, located on the Royal Roads University campus. An event poster in pdf format can be found by clicking here: Mother's Day Paint In Poster 2010. The event takes place on Mother's Day-- Sunday, May 9th-- and this year's milestone festivities promise lots of entertainment for the whole family. Admission is free, and parking for the whole day costs $5. The Paint In takes place from 10 am to 4 pm, and I will be exhibiting my artwork at Booth #53 (closer to the lower parking lot than to the Castle itself). 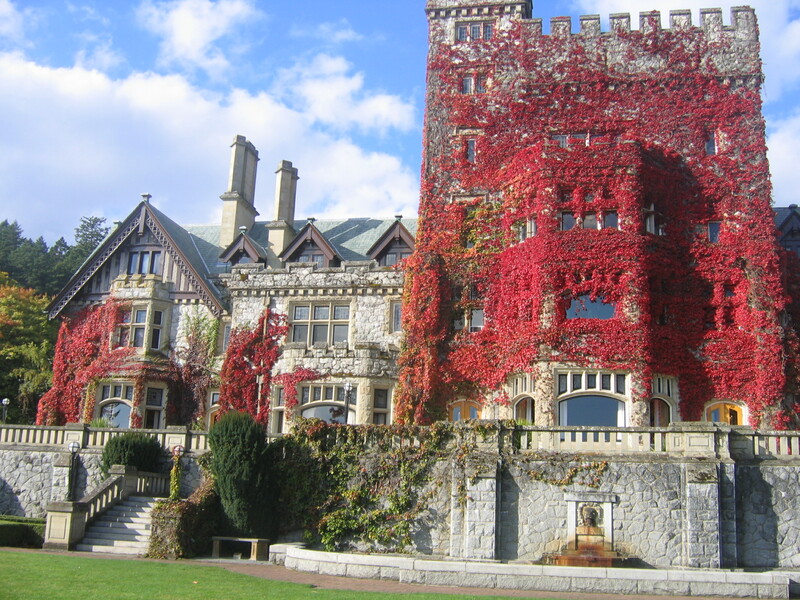 If the weather cooperates, I also hope to be working on an original painting of the Hatley Castle while I am there. Thank you for your support, and I hope to see you there! I have been down at the Harbour a few times already this season, and now that April is here, I will be working there every day this summer, weather permitting of course. It has been wonderful to see some familiar faces returning to my booth and to meet new people every day. I wish I could say that I completed everything I hoped I would finish between last season and this one, but in between numerous commissioned pieces and moving, I have yet to finish a new painting of my own! Please feel free to stop by the Inner Harbour and say hello if you are in the area. I am usually working from 11 am to 6 pm (or thereabouts) when it is not raining or too windy. See you there! 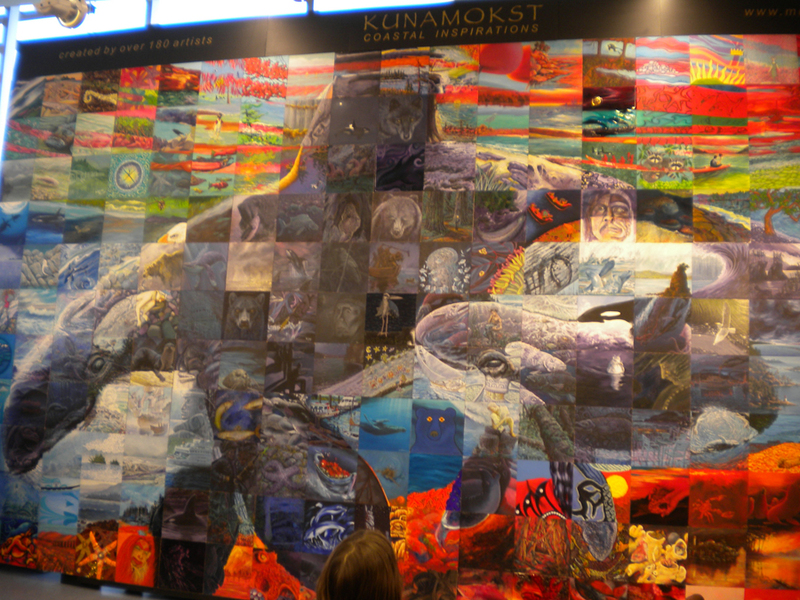 In February, I had the great privilege to be in West Vancouver when the completed Kunamokst Mural Mosaic was finally revealed. 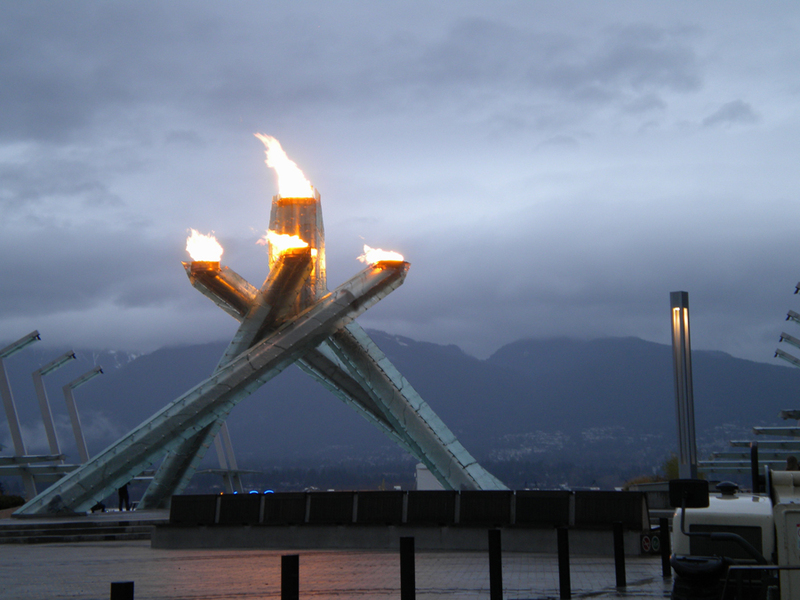 The unveiling coincided with the 2010 Winter Olympic Games in Vancouver, so it was great to get over to the mainland and to take in some of the festivities! I did not realize beforehand that the unveiling event was intended primarily for the participating artists, so I was pleasantly surprised to find myself in the company of dozens of co-artists when the curtain fell down the face of the mural! 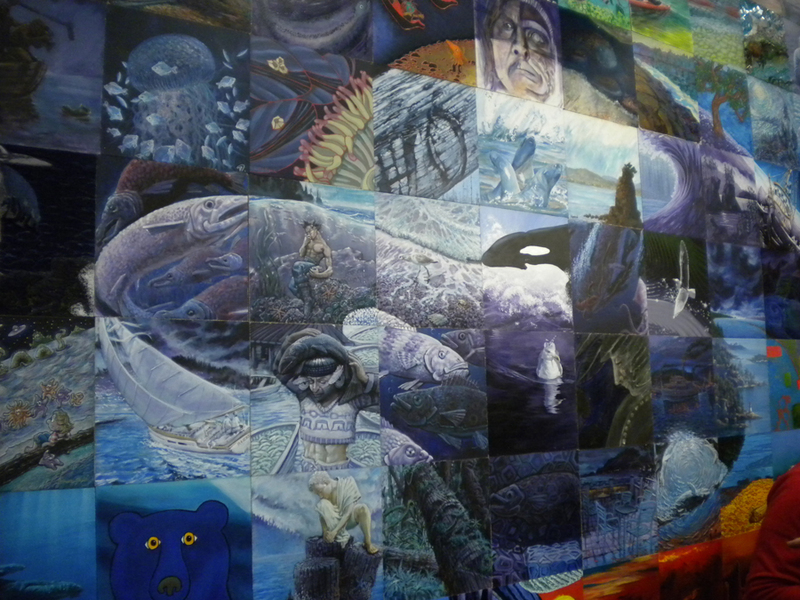 As expected for a mural with a 'west coast' theme, the Kunamokst Mural Mosaic depicts a mother and calf orca whale pair. My panel, #102, comprises part of the back of the mother whale. Words cannot fully describe what it was like to see the mural in person. I have always admired the comprehensive and interactive website for the mural mosaics (www.muralmosaic.com), but seeing the completed 12' x 20' mural right in front of me was something different entirely! 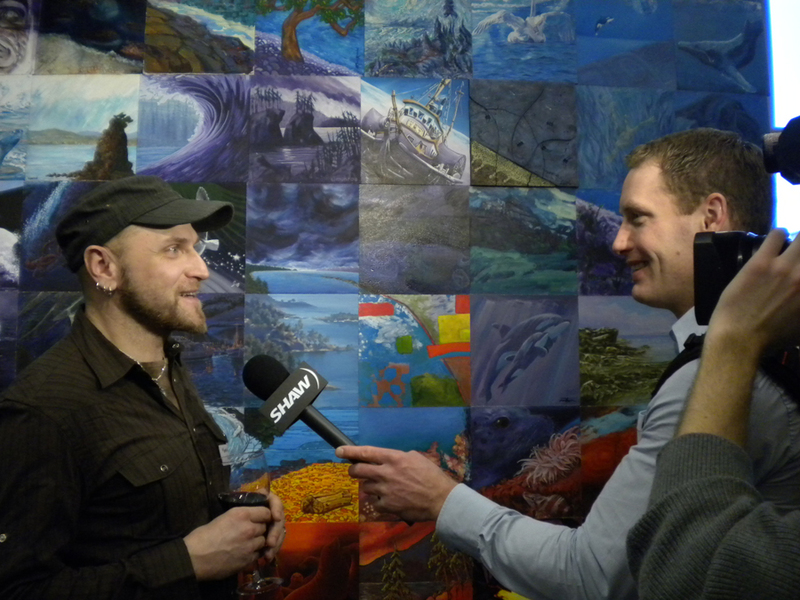 Getting to admire the brushstrokes and textures of all of the other pieces was an exhilarating experience, and I was also humbled to meet the creators and producers of the mural mosaic projects-- in particular, Lewis Lavoie, Paul Lavoie, and Phil Alain. 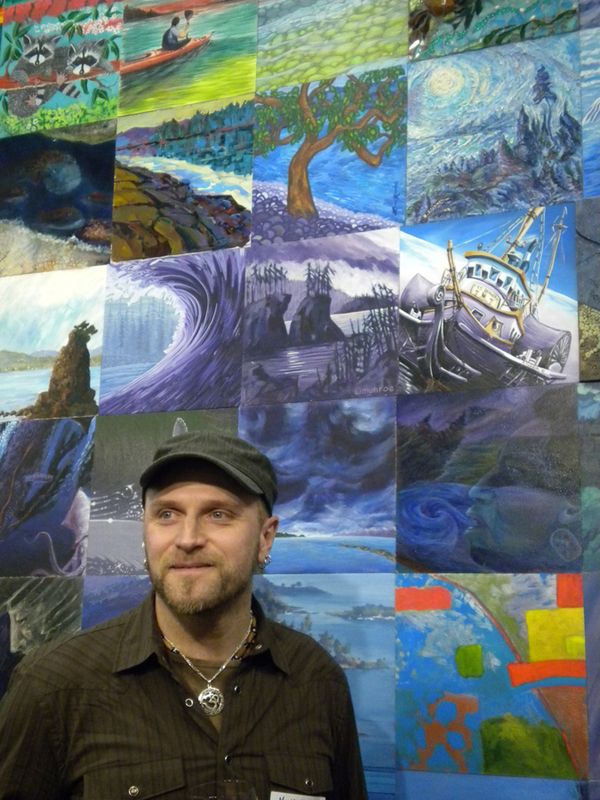 The mural will eventually find a permanent home in the hotel lobby on Galiano Island, so I encourage any visitors to stop by and see it! As I say, nothing is quite like seeing the mural up close and in person. I am so thankful to have been a part of this process and to have been there for the unveiling. What an opportunity!